The upstairs and downstairs units each have 2BR/1BA layouts with the living room couches designed to accommodate additional sleeping needs. The kitchens are fully stocked in order to cook lavish meals. The colors, decorations, and furniture have been carefully selected to provide a unique and magical Mexican experience. The backyard pool and garden area is shared by both upper and lower bungalows. Wifi is available in both units. 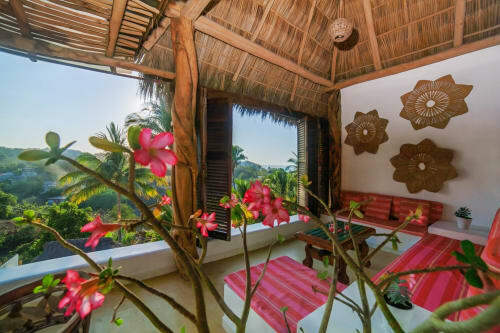 Casa Dos Amigos offers a true Sayulita Nayarit Mexico dream vacation. 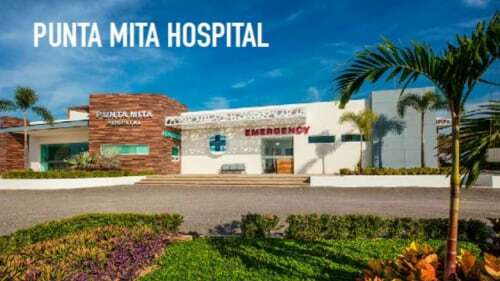 Please use the contact form for any questions and to arrange your stay. 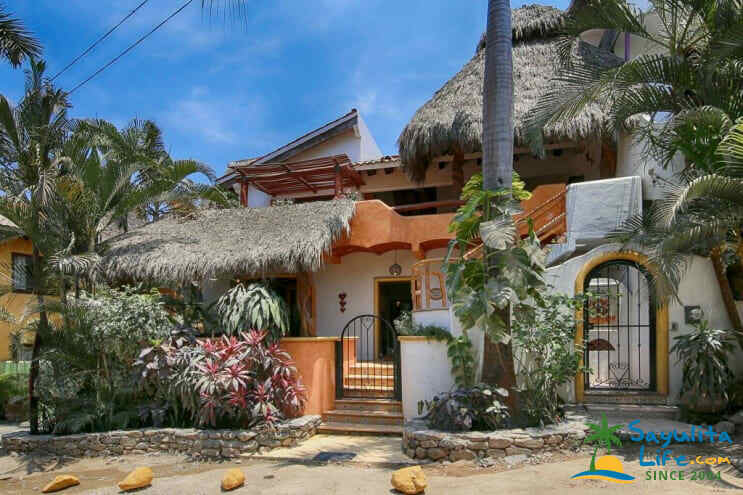 We look forward to welcoming you to Casa dos Amigos in Sayulita! This was our fourth visit to Sayulita and we wanted to try a new rental, bringing two kids with us this time. We were very happy with our stay and experience. Management is very quick to communicate with and accommodating. We were a little worried prior to our arrival about renting the open air upper unit having two young ones, but didn't have any concerns during our stay. We absolutely loved how spacious it was! The open air shower was fantastic (lots of hot water) and provided for a unique rental experience in addition to the open air living room, patio and kitchen. The location was great- close walk to the beach and town/stores. The Soup Lady is right next door and the Iguana tree just down the street (huge attraction for our little guy). We thought it might get loud during the evenings from the town sounds, but once the bedroom doors were closed, you couldn't hear the music like you could in the living room/kitchen. The pool area was very peaceful and well kept. The pool water was refreshing after a day at the beach, but just a bit cold for our young ones. The staff were friendly and trust worthy, although they don't speak English so maybe a couple lost in translation moments trying to communicate. We had read in a review the beds were hard, and they are a little in comparison to our ones back home, but we got used to them quick and the pillows were very soft. We also enjoyed that there wasn't a television so we could enjoy more family time. The wifi worked well when we needed to tap into some technology. Overall, very happy with our stay and would like to return with more family again for our next visit. Thank you very much for the nice review Nicole! I just would like to add that in the meantime we replaced all the mattresses in the house with new, comfortable, quality mattresses. Sooooo wonderful!!! We loved every single thing about this place!!!!! Couldn't have asked for a better place to stay! We loved this house (lower unit) and would stay in it again. You can’t beat the location, close to everything you need in town including tons of great restaurant options for every price range and close to the beach. The yard was beautifully maintained with tropical plants making for a serene setting and the pool was nice to have on those really hot days. The house was kept very clean and we loved having the outdoor shower so that we didn’t drag sand in everywhere inside. The owners were great to deal with, they answered our questions and made it an easy process. We hope to return again! Best location, very clean, great owners and staff, great house for kids. We have stayed here about 8 times and you can't beat it. Me, the wife and kids stayed at Dos Amigos in July and we had a wonderful time. The location is absolutely perfect for the beach, eating and paletas. The accommodation is super clean and very comfortable. The owners are great hosts. We love Sayulita and could not recommend Dos Amigos highly enough. For the first week it was just the two of us and perfect for an adult escape, second week the kids came and they enjoyed it as much as we did. Nice location, great iguana watching across the street! We had 8 people and a baby and having the two floors was great. The second floor was our base and we spent a lot of time watching the iquanas in the trees across the street, as well as the birds soaring overhead. Being so close to the beach and town was awesome as well. Best to bring earplugs, or the band at Dom Pedros might entertain you in the wee hours. Casa dos amigos is just fine!! It is very good located, everything is nearby, beach, downtown. The pool is good, deep enough. The rooms are nice and comfortable! I really recommend this house! This was a fantastic rental for traveling with several families! It was clean and comfortable and we all had our own space but were able to get together at the pool and on the patio. It was close to town so the kids could walk to get street tacos and ice cream. The teenagers were able to go back and forth to the beach since it is only a couple blocks away! We had a great view from our balcony of the Iguanas in the "Iguana Tree" across the street. The housekeeper was so kind and helpful and kept the place looking great. 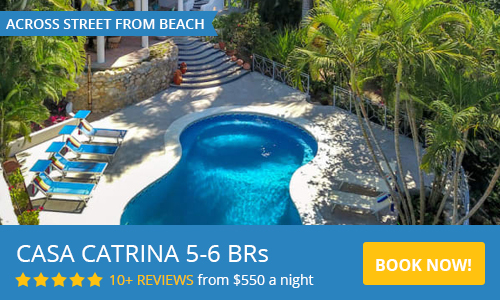 We will definitely make this a family tradition to visit Sayulita! The entire house consists of 4 Bedrooms, separated in two 2 BR/2 BA bungalows. Each level has separate entrance and its own kitchen. Hi, we are Sophie and Ruben, parents of Luna and Manou.Like many other visitors, we came to Sayulita on a surf tripand immediately lost our hearts here. Not long after, wepacked what we could into the car, and moved. We are originally from Belgium. We've lived for 8 years inbeautiful Laguna Beach, California, and now we live full timein equally beautiful Sayulita, Nayarit.